Many people choose to extend their walking tour in Italy by visiting Rome. This could be easily done if you have booked Hedonistic Hiking's A Tuscan Harvest, Lucca, Volterra and Elba, The Wilds of Abruzzo or Parma, Tuscany and the Ligurian Sea. Where to begin? There can be few cities on earth where the ancient and modern rub along so closely together. Every time you turn a corner in Rome there is an awe-inspiring architectural or artistic masterpiece. It is the seat of Italy's government but also the global headquarters of Catholicism and there are more churches in the city than there are days in the year. It is busy, noisy, chaotic and colourful and, with over 2000 years of history to uncover, a whole year here would not be long enough to see it all. The iconic symbol of the Eternal City. A massive arena which could seat 50,000 spectators, this is where the infamous and gruesome Gladiatorial games took place. This "temple to all the gods" was completed by Hadrian in around AD120 and is the greatest architectural achievement of the Roman period. It has the largest masonry dome ever built and is perfectly proportioned - the diameter being identical to its height. Built on the site of St Peter's tomb, the Basilica took 150 years to complete and many celebrated artists and architects were involved, not least Michelangelo who was responsible for the Dome. There is now a railway line connecting the Vatican to Castel Gandolfo, the Pope's summer palace. The ticket includes access to Vatican museums and Sistine chapel, gardens and Castel Gandolfo. More information can be found online. Home of one the greatest artworks of all time, the chapel has an 800 sq metre ceiling which was frescoed in its entirety by Michelangelo between the years 1508-1512. This piazza and the famous Spanish Steps which lead up to the Trinita dei Monti church at the top is a great space for people-watching. Try to come here early evening for the passeggiata. Many of Rome's most fashionable shops are located on the streets leading up to the piazza. By day this is a lively fruit and vegetable market and by night a hot-spot for the city's bright young things. The piazza is lined with restaurants and bars. Newly opened in the Air Terminal of the Stazione Ostiense on the south side of the city is the latest of the Eataly stores, a "supermarket" dedicated to premium quality produce from all over Italy, supporting artisanal producers who maintain traditional methods. Well worth a visit! It is almost imposs ible to choose highlights in Rome as it will depend on your personal interests and there is simply so much to see and do that it can be overwhelming with only a short amount of time. You will certainly need to come armed with a good guide book and maps, and also be clever at planning your excursions in order to avoid long queues. For an authentic insight into the city we highly recommend a private guided tour with Rachel Potts. 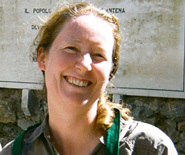 Her in-depth knowledge can help you to tailor the perfect tour and she will make it an unforgettable experience. Contact Rachel for further details. Rome has a huge number of hotels and your budget will make a big difference to where you might stay. A useful website is http://www.rome.info/hotels which you can peruse in English. Some of these hotels listed below are known to Hedonistic Hiking and others are recommendations from people who have extended their walking tours in Italy in Rome. Across the river in Trastevere, this is a charming hotel situated in a 16th cloister has all rooms facing onto a quiet courtyard. Formerly a cardinal's residence, this elegant 23 room hotel is centrally located closed to Piazza Navona. There's a beautiful 17th century stone staircase, but no lift! Close to the Trevi Fountain, this building offers three fully furnished apartments for rent for up to 5 people. In the historic Trastevere district this medieval hotel offers simple accommodation with a pretty internal courtyard. The Domus was established by the Catholic Church in Australia, to provide a place for travellers to Rome to be able to stay while visiting the Eternal City and it has 32 bright spacious rooms. A 54 roomed religious guesthouse situated close to the Castel Sant'Angelo and the Vatican. It has a wonderful rooftop terrace, WiFi and plenty of parking. The airport is situated to the west of Rome, close to the coast, and it's a 45-60 minute journey into the centre by taxi or train. If you have a quick turnaround or do not have time to explore the centre of Rome then you might choose to sleep at the airport. There are two Hilton hotels - the first listed here is a short distance from the terminal but has a regular shuttle service to and from and the second is connected by a pedestrianised walkway. Another value option is to stay in the village of Fiumicino, from which the airport takes its name, which is a characteristic port but requires transport to and from the terminal. We would recommend a hotel with a shuttle service as the airport taxi drivers are often looking for a better fare and, in preference, will take passengers into the centre of Rome. Hotel Seccy and Comfort Hotel are two possibilities. Easy to miss tucked into a narrow alleyway, but unmissable in terms of food. Due north of the Pantheon. Serving typical Roman dishes since 1961 this restaurant is well placed for the Pantheon. Salita Dei Crescenzi, 31 Tel +39 06 68803034. Closed Saturday evening and Sunday. A small but friendly restaurant specialising in dishes from Le Marche from where the family who own it hail. Just close to Piazza Vittorio Emanuele II in Via di San Vito 13. Make a reservation! Tel +39 06 4466573. Closed Sunday evenings and Mondays. Very close to the Campo dei Fiori, good quality Roman dishes and friendly staff. See the link to the accommodation above - the Domus Australia in Via Cernaia offers two restaurants - a Rooftop Terrace which is open in the warmer months and a Dining Room, both serving authentic Italian cuisine. Many people, including local Romans, cite this as the best ice-cream shop of all time. There is one at Via Panetteria 42, close to the Trevi Fountain, or another close to the Pantheon at Piazza della Maddalena 3. For an interesting dining experience in Rome take a look at this site and think about trying a home restaurant. Those with the Verified Host badge have been visited personally by the BonAppetour team and been given their seal of approval. The company Walks in Rome also offer fun cooking classes for pasta, pizzas and ice-cream as well as Vatican Tours and day trips out of the city. Artichokes or carciofi are the quintessential Roman vegetable and appear in all kinds of guises. Spaghetti carbonara, made with eggs and pancetta is a staple, along with penne all'arrabbiata which has its tomato sauce heated up with chillies. Saltimbocca - a dish of sauteed veal escalopes with sage and prosciutto is delicious. Romans are also famous for the use of offal - such delicacies as milk-fed calf or lamb intestines, and oxtail. Remember too that Rome is an ice-cream capital - stopping for a Gelato should be compulsory when it tastes this good! Lazio is primarily a white wine growing area, the most famous of which is Frascati. Rome's international airport is Fiumicino, which is west of the city and connected by a rail link straight into Termini central station. A second airport at Ciampino serves other European cities and many of the budget flights use it. A regular bus service from here also takes you to Termini train station. From Rome Termini you can easily connect north and south to all major cities. To get about in Rome you will see most of all on foot, but there are trams, an underground system and buses. For a chauffeured limousine service to and from the airports of Rome or for day trips in the area around Rome/Lazio contact Mirabella cars on +39 335 689 0169 ormirabella.50@gmail.com.